No matter how far you've traveled down the wrong road - turn back: Hell on earth, and then...? My son just finished a research paper on the fascinating life of William Wilberforce (1759-1833), "the greatest social reformer in the history of the world." (Metaxas, p. xvii) He is best known for his 20-year battle - and ultimate victory - for the abolition of the slave trade in England. 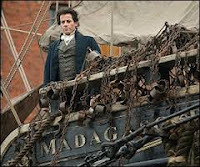 We watched the movie "Amazing Grace" and read the book by the same name and became inspired by Mr. Wilberforce's great faith and perseverance in the face of great resistance. Another aspect that affected me deeply was realizing and contemplating the overwhelming injustice and suffering that occurred over so many years to millions of human beings. The bulk of the English slave trade was carried out on ships that transported men, women and children (usually kidnapped) from Africa to the West Indies (called the 'Middle Passage' to be sold as slaves. And, of course, there is so much more - much worse abuse and injustice that these men, women and children suffered. I also read the book "The Kidnapped Prince: The Life of Olaudah Equiano". This is Equiano's life story in his own words. As a boy, he was taken by force from his home in Africa, sold over and over, abused, almost dying several times before buying his freedom and residing in London, where he joined the abolitionists in their cause. His book was a best-seller. It is a captivating story. Truthfully, someone like me, a pampered American, can hardly imagine the terrors he experienced. The reason I share all of these descriptions, is to invite you into my thinking. When I consider the great suffering and, at times, completely wasted lives of these particular Africans at that time in history - literally millions of them - I also consider our ridiculous theology. I can't help but recall the doctrine of hell and the many, many times I have heard the teaching/preaching that states unequivocally that those who haven't heard of Jesus will suffer in hell forever. The vast majority of these Africans never heard of Jesus. I wish I had the grace of William Wilberforce right now, as he always petitioned for justice without condemning. I'm sorry, but I just can't fathom that Christians would believe our Lord and Savior would allow human beings to suffer untold atrocities at the hands of men on earth, and then - because they were not brought the good news - are to be thrown into hell for eternity! Those who believe this did not get their doctrine from the Bible. That theology - this traditional view of hell - came from men and the teaching of men through the centuries. Show me one place in the Bible where it teaches that Gentiles will go into the eternal fire for not hearing the Gospel. Even in the parable of the sheep and the goats, the judgment is based on what one DOES for another. Did you feed, clothe, visit, help the least of these? By all means, obey Jesus and make disciples, explaining to them the Way of life. We are to be about the Father's work and sharing the Gospel to the ends of the earth - but NOT because if we don't all those people will be tormented forever in hell. Friends, it may be time for a new start. Go to the Word. Not man's words, but THE WORD. Go back and read the Scriptures as if a babe, and hear God's words as if you didn't have preconceived theology coloring the eyes of your understanding. If you could choose what happens eternally to those kidnapped, tortured and murdered Africans - what would you choose? The comforting arms of 'Abraham's bosom' or the fiery torment that longs for a drop of water on the tongue? I know, I know, you are not God. But what would you choose? Is your mercy and compassion beyond our Lord's? Is our sense of justice greater than Jesus'? That is ridiculous! 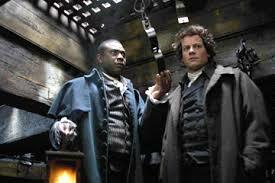 I doubt Wilberforce fought his whole life to liberate the slaves, thinking they would spend eternity in fiery torment. I, for one, trust in the mercy of the Lord. I would much rather fall into the Hands of God than the hands of man. Who are we to say whom the Lord will show mercy? His ways are higher than our ways. Amazing Grace: William Wilberforce and the Heroic Campaign to End Slavery by Eric Metaxas. Harper Collins Publishers, New York, NY, 2007. The Kidnapped Prince: The Life of Olaudah Equiano by Olaudah Equiano, adapted by Ann Cameron. Alfred A. Knopf, New York. 1995.
Who can dwell with everlasting burning?